The special lunch briefing for press and other industry VIPs is scheduled for Oct. 30, 2017. This by-invitation-only briefing will take place in a private room from 11:30 a.m. – 1:30 p.m. Las Vegas time. To request an invitation to the Oct. 30th special briefing, please email Paul Osterberg, cleverDome’s project manager: Paul@StrategyBaseCamp.com or Aaron@cleverDome.com. Journalists who would like to view a special virtual briefing (video recording) may request that media-only information by emailing Leesy Palmer of Impact Communications: LeesyPalmer@ImpactCommunications.org. cleverDome is a professional co-op that delivers cybersecurity solutions to its members (fintech providers, broker/dealers and RIAs, custodians and financial advisors) who want to work together and solve big problems in the financial services industry, such as cybersecurity and all of the problems that inevitably occur with a data breach. Entreda is a company that monitors, remediates and enforces cybersecurity compliance on any user or device, 24x7. As Entreda’s CEO and co-founder, Yenamandra is an active and influential leader in the cleverDome co-op. NetFoundry is a Tata Communications business. Tata Communications is a $2.9 billion annual revenue company. NetFoundry’s platform, which provides secure application-specific networks with the reliability of a private enterprise WAN (a.k.a., a programmable Internet), is a leader in the cleverDome co-op. Professor Isaac Ben-Israel, one of Israel's top experts on Space, Cyber and technological related security will be a keynote speaker. He holds a PhD in Philosophy and a BSc in Physics and Mathematics from Tel Aviv University where he currently serves as head of the Security Studies program. In addition, he serves as the chairman of the Israeli Space Agency and the National Council for Research and Development, under the auspices of the Ministry of Science, Technology and Space of Israel. Jeffery Concepcion, CHFC, Founder and CEO of Stratos Wealth Partners, will talk about how the 175 advisors in his Super OSJ use technology to better serve their clients and run more efficient businesses. Stratos is a national network of distinguished, experienced financial planning practitioners spread throughout the country, all powered by LPL Financial, member FINRA/SIPC. Steven M.H. Wallman, Founder and CEO of FOLIOfn, Inc. which, directly and through subsidiaries, offers various financial technology and related services including Folio Investing, Folio Institutional, VIAFolio, First Affirmative Financial Network, and The SRI Conference, will share how the Folio family delivers innovative tools and technology that benefit investors and those who serve them. Brian Edelman, a cybersecurity expert and CEO of Financial Computer, will discuss how firms must comply with New York DFS Cybersecurity regulations. He will cover the procedures, steps and tools companies can leverage to create rapid, successful transitions in becoming cyber-compliant. Bob Veres, publisher of Inside Information and author of The New Profession, will discuss how rapid technology changes, crowdsourcing and an expanding awareness of the fiduciary concept are combining to change the dynamics and competitive balance in the financial services industry. Randolph A. Kahn, Esq., a recognized authority on the legal, risk, governance, and compliance issues of information, will discuss the complexities of being mobile and social in 2018 and beyond. The session will not only address the problem facing broker/dealers today but will offer a pragmatic path forward. Kahn is a professor, award-winning author and acclaimed speaker who has spoken hundreds of times across the world. 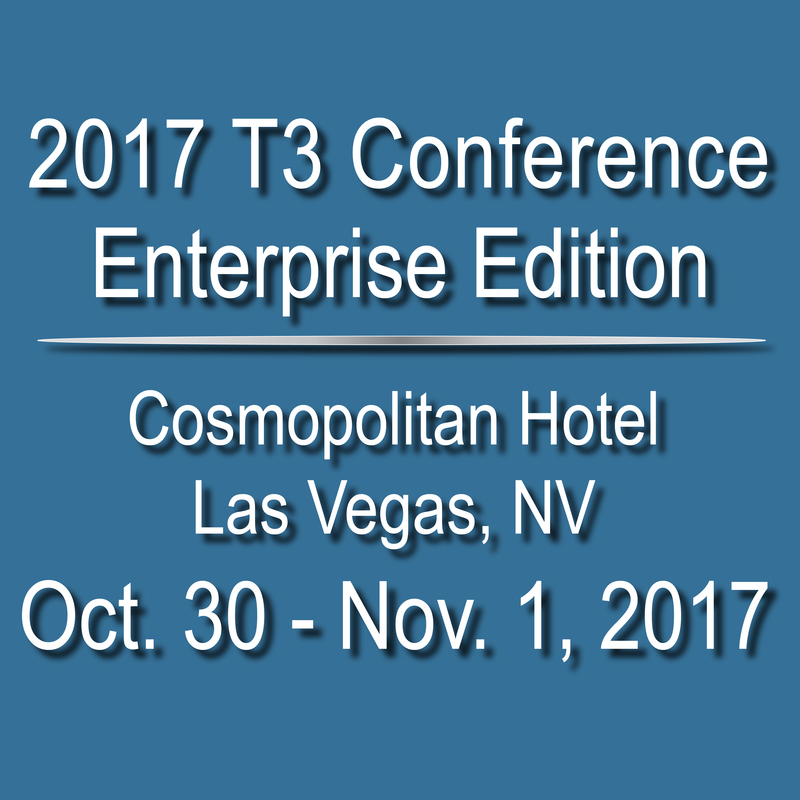 The T3 Technology Conference for enterprises is specifically designed for heads of large RIAs, and executives from IBDs, banks, credit unions, insurance agencies and other financial services firms who are interested in learning about the latest and greatest technology-related solutions for their firms and any advisors they correspondingly serve. The event will take place Oct. 30 - Nov. 1, 2017 at the Cosmopolitan of Las Vegas hotel and resort. T3’s room block is expected to sell out; attendees are encouraged to book now. Registration is complimentary for financial services executives and heads of large financial advisory firms. Please click to register in the appropriate category.